An alternative energy research project, NASA and the ERDA installed this turbine at the Plum Brook Facility in 1976. 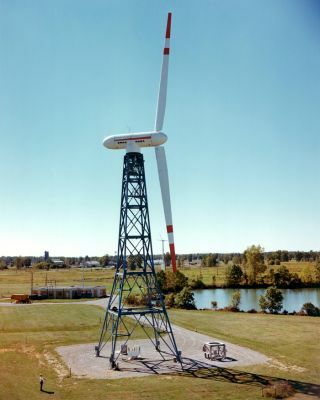 In this historical photo from the U.S. space agency, spurred by the energy crisis, NASA, the Energy Research and Development Administration (ERDA) installed this 100-kilowatt wind turbine for alternative energy research at Plum Brook. The 100-foot tower supported two sixty-two foot blades, which could reach forty rpm in eighteen-mph winds. When the Plum Brook reactor shutdown was announced, Congressman Mosher and others endeavored to find alternative uses for Plum Brook Station. The wind turbine was one of the few successful programs at the station in the 1970's and 1980's. By the late 1980's, several of the testing sites at Plum Brook were reactivated and remain in operation today.